1.This case based on 1:1 die cutting to make sure it\\\\’s 100% fitted for Your Phone. 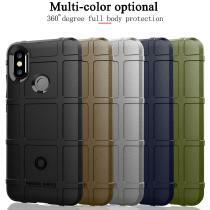 2.Its TPU+ Silicone complex structure makes it more stronger than the traditional phone cases. 3.Hard clear back case with flexible Sturdy frame to protect your phone perfectly. 4.Enough thickness to give your phone enough protection amp,nice hand-feel simultaneously. 5.Super light weight design and Super anti falling ability, good case brings good protection without extra burden beautifully. [Material]: Made of High Quality TPU.